Thalidomide and its derivatives (lenalidomide, pomalidomide, avadomide, iberdomide hydrochoride, CC-885 and CC-90009) form the family of immunomodulatory drugs (IMiDs). Lenalidomide (CC5013, Revlimid®) was approved by the US FDA and the EMA for the treatment of multiple myeloma (MM) patients, low or intermediate-1 risk transfusion-dependent myelodysplastic syndrome (MDS) with chromosome 5q deletion [del(5q)] and relapsed and/or refractory mantle cell lymphoma following bortezomib. Lenalidomide has also been studied in clinical trials and has shown promising activity in chronic lymphocytic leukemia (CLL) and non-Hodgkin lymphoma (NHL). Lenalidomide has anti-inflammatory effects and inhibits angiogenesis. Pomalidomide (CC4047, Imnovid® [EU], Pomalyst® [USA]) was approved for advanced MM insensitive to bortezomib and lenalidomide. Other IMiDs are in phases 1 and 2 of clinical trials. Cereblon (CRBN) seems to have an important role in IMiDs action in both lymphoid and myeloid hematological malignancies. Cereblon acts as the substrate receptor of a cullin-4 really interesting new gene (RING) E3 ubiquitin ligase CRL4CRBN. This E3 ubiquitin ligase in the absence of lenalidomide ubiquitinates CRBN itself and the other components of CRL4CRBN complex. 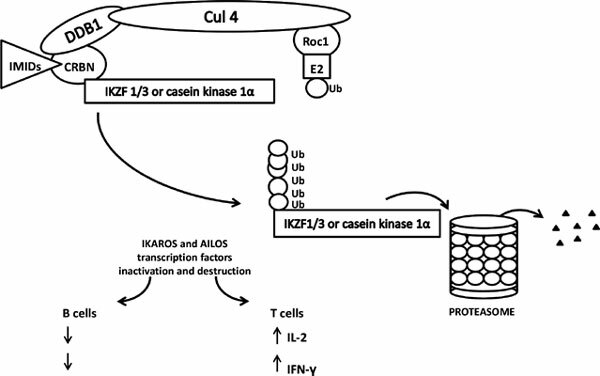 Presence of lenalidomide changes specificity of CRL4CRBN which ubiquitinates two transcription factors, IKZF1 (Ikaros) and IKZF3 (Aiolos), and casein kinase 1α (CK1α) and marks them for degradation in proteasomes. Both these transcription factors (IKZF1 and IKZF3) stimulate proliferation of MM cells and inhibit T cells. Low CRBN level was connected with insensitivity of MM cells to lenalidomide. Lenalidomide decreases expression of protein argonaute-2, which binds to cereblon. Argonaute-2 seems to be an important drug target against IMiDs resistance in MM cells. Lenalidomide decreases also basigin and monocarboxylate transporter 1 in MM cells. MM cells with low expression of Ikaros, Aiolos and basigin are more sensitive to lenalidomide treatment. The CK1α gene (CSNK1A1) is located on 5q32 in commonly deleted region (CDR) in del(5q) MDS. Inhibition of CK1α sensitizes del(5q) MDS cells to lenalidomide. CK1α mediates also survival of malignant plasma cells in MM. Though, inhibition of CK1α is a potential novel therapy not only in del(5q) MDS but also in MM. High level of full length CRBN mRNA in mononuclear cells of bone marrow and of peripheral blood seems to be necessary for successful therapy of del(5q) MDS with lenalidomide. While transfusion independence (TI) after lenalidomide treatment is more than 60% in MDS patients with del(5q), only 25% TI and substantially shorter duration of response with occurrence of neutropenia and thrombocytopenia were achieved in lower risk MDS patients with normal karyotype treated with lenalidomide. Shortage of the biomarkers for lenalidomide response in these MDS patients is the main problem up to now. Cereblon, casein kinase 1α1, cullin 4-containing RING E3 ubiquitin ligase complex, Ikaros family, immunomodulatory drugs, lenalidomide, pomalidomide, multiple myeloma, del(5q) MDS, mantle lymphoma, proteasome.